Healing crystals are having a capital-M Moment right now. Millennials are killing a variety of businesses, but the wholesale tumbled rock industry is not one of them. So what’s the deal? Yes and no. Our personal beliefs about crystals notwithstanding, I think we can all agree that if hard science could prove that crystals really heal physical ailments, Big Pharma would’ve found a way to monetize it by now. But crystals do have some scientific value. In an 1880 experiment, Marie Curie’s husband Pierre and his brother Jacques found that when they struck quartz, it made an electrical signal. And other crystals have the ability to transform mechanical energy into electrical energy, a phenomenon known as piezoelectricity. Oh, high school science, how we missed you. What was the question? Rose quartz pendants available in Chrysalis Studios’s Etsy shop. 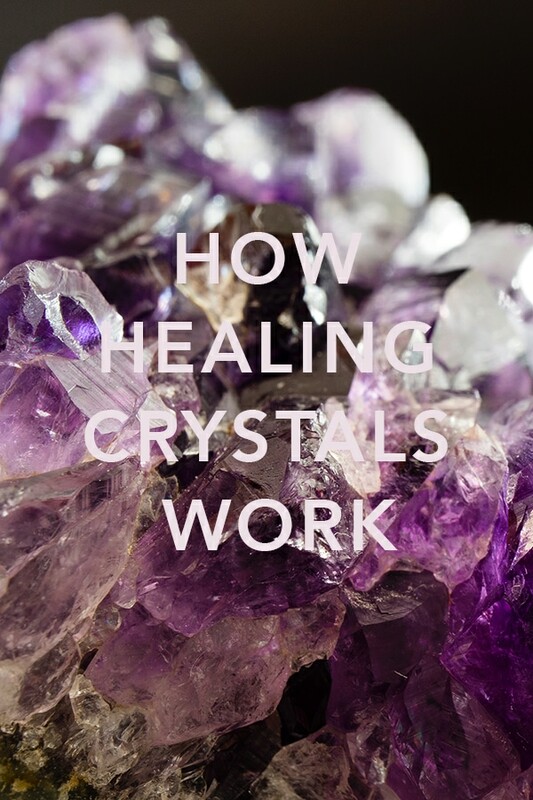 How Do Healing Crystals “Work”? Bay Area comedian and self-proclaimed crystal expert Kristee Ono says that “the general theory behind crystal healing is best described as vibrational energy.” No, lawyers reading this, we are not suggesting you do that with your crystals. Those who believe in the power of healing crystals believe they interact with the energy around them and directed towards them. Positive energy is high vibration — like the feeling you get when you’re laughing with friends — while negative energy vibrates at a lower frequency — like the feeling you get when you’re a child who sees dead people. This energy interaction helps with intention setting, mindfulness, and emotional well being. Case in point: they did a really great job at getting rid of our ex. 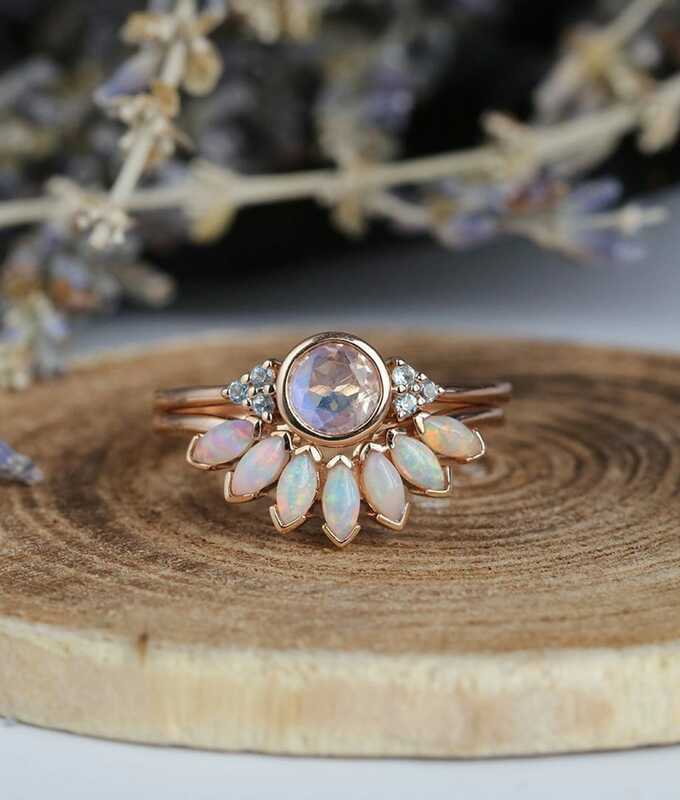 Moonstone ring available in BrilliantRings’s Etsy shop. The right healing crystal for you is the one that jumps out at you and speaks to you. Ono says “in the end it’s just a rock, so pick the one that’s prettiest to you.” One black onyx to match our soul, please! Crystal meanings and correspondences associated with each stone vary depending on the source. Rose quartz is said to help improve self-esteem and unconditional love. We can also get both from our rabid dog, but we’re not supposed to bring her everywhere. Supposedly she’s a “health hazard.” Anyway, Ono calls rose quartz the “101 stone” because it’s a perfect entry into what’s about to become your new crystal obsession. Ono recommends carrying this crystal on you as a physical reminder to treat yourself with patience and radical self acceptance. We’ve been carrying our rose quartz for a few days and are now totally OK with the fact that we have rabies! This purple stone may help reduce stress… unless you’re trying to spell it. It’s also rumored to foster stability, sobriety, and protection. Spencer Pratt recently spent $80,000 on a giant raw amethyst and he doesn’t seem stressed out at all, even with a newborn! That’s magic, baby! Citrine can be good for boosting creativity, success, and manifestations. These gold-toned beauties are associated with the sun’s energy and their high vibrations are said to inspire creativity and motivation. If you’re an artist or maker, try sleeping with citrine under your pillow. Nothing like disturbed sleep to encourage creativity! The pattern on this stone looks like the ocean, and is said to enhance communication skills. It’s associated with the throat chakra, and is the stone to pack for an extra boost of confidence if you need to give a big presentation or have a serious talk with your boss, a close friend, or roommate who’s been stealing your oat milk. We know it’s you, Karen. Tourmaline comes in a wide spectrum of colors, and black tourmaline is said to be protective (like amethyst) but also useful for grounding. The good kind, not the go-to-your-room kind. Also, slightly easier to spell. 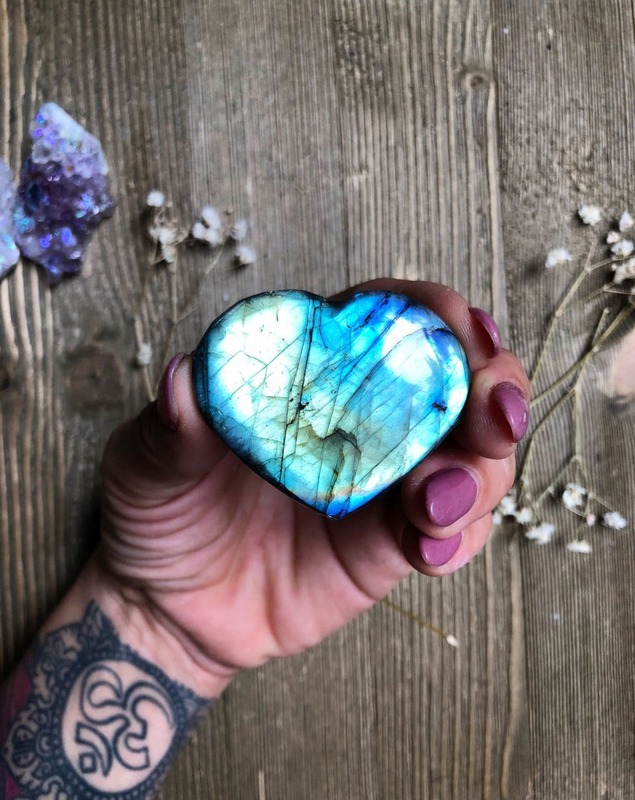 If you’re looking to develop your psychic powers and become the next Long Island Medium, labradorite is the stone for you. Can you tell what we’re thinking? How about now? Labradorite heart available in Promote Peace’s Etsy shop. Because crystals are thought to absorb, reflect, or amplify energy, it’s advised that one “clean” their crystals before using them. You don’t have to do this every time, just before you begin to use them or when you’ve been through some particularly icky stuff and need to release some baggage. Crystals! They’re just like you getting ready for a first date! Blue lace agate stones available in Qwel Qwel’s Etsy shop. 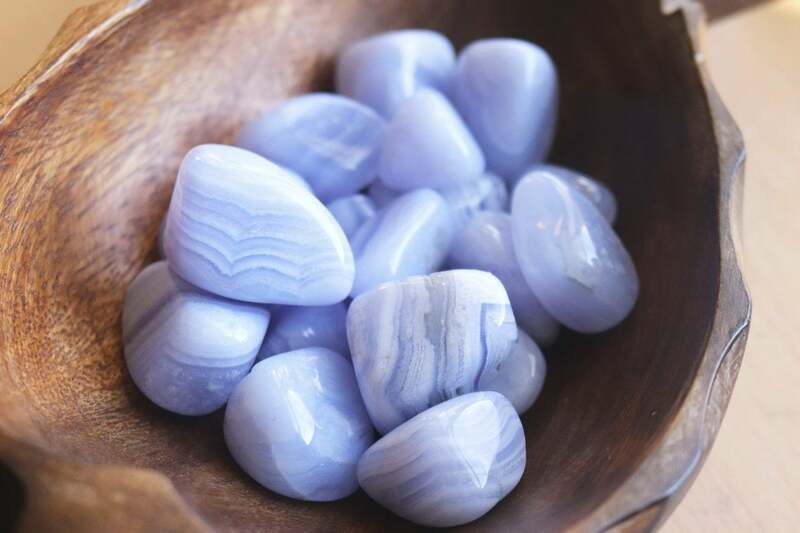 You can clean your crystals by sitting them in the sunlight, the moonlight, saging them, placing them in a salt bath… then focus your intentions and think about what you would like the stone to help you manifest. Love? Money? Improve your focus – ooh was that a Bumble notification? When your stone is programmed place it where you think it’ll do the most good. 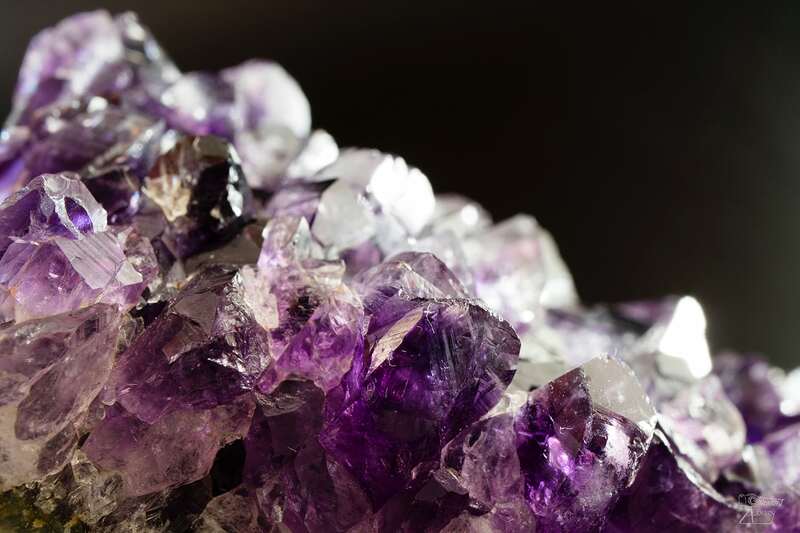 Place amethyst by the bed for calming dreams. Fluorite on your desk for focus. For personal development, try carrying the stone on you. 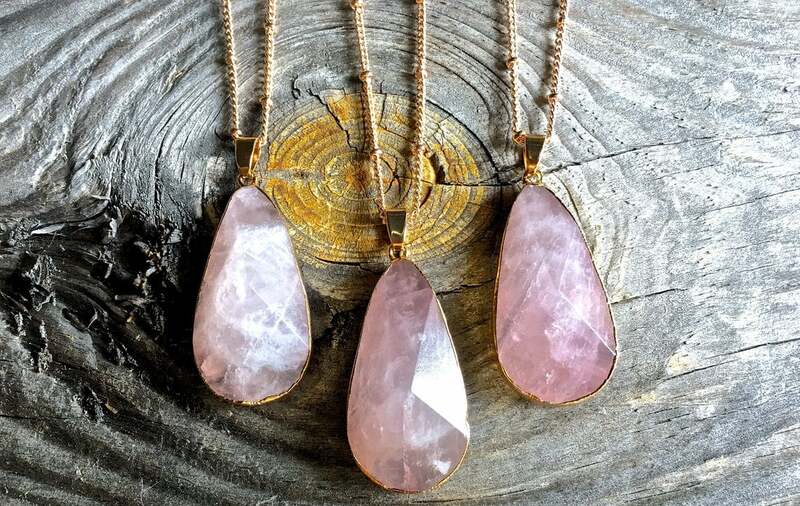 Putting rose quartz in your bra opens your heart chakra, draws love to you, and most importantly, reminds you why underwires have been banned from your lingerie drawer.